The North Dakota Mutual Aid Agreement template is available to download below. Implementation of formal mutual aid agreements is a rapidly growing trend in the United States and this document provides instructions on how to implement it. 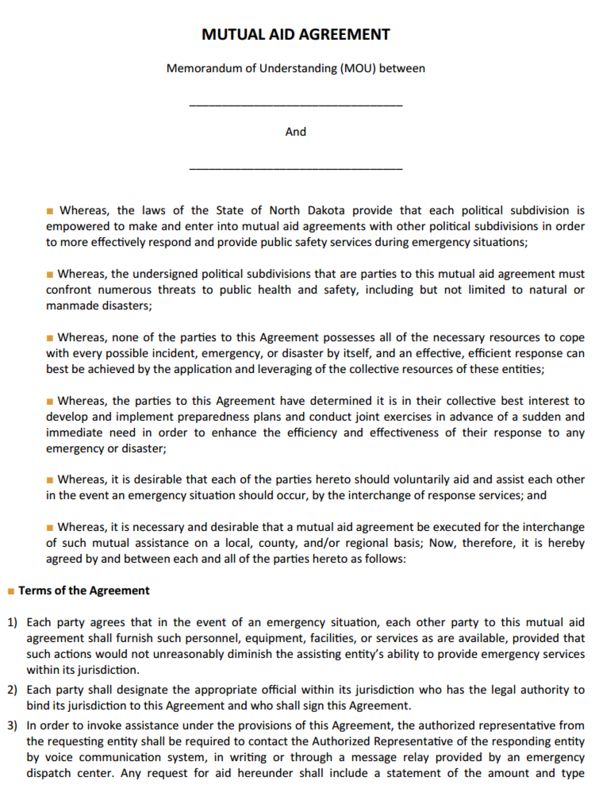 The Mutual Aid Agreement Template meets all the minimum requirements set forth by the North Dakota Century Code for Jurisdictions and Organizations in the event of disasters or other incidents which require external assistance. The first section of this mutual aid agreement gives you details to the background of the formation of this document. It states that because many jurisdictions lack resources and managing emergency events that affect the health, security, safety and the property of the jurisdiction and its residents. This document was created to ensure the public safety community utilizes the finite resources and provides maximum mutual aid. Both the parties agree that they will provide adequate mutual aid like; Personnel, equipment, facilities or services in case of an emergency situation. Both parties will designate an appropriate official who will authorize all decisions to be taken on behalf of the party and he will also sign this agreement. In case of an emergency situation the authorized representative will need to contact the other authorized representative either by voice communication system or in writing or a message relay provided of an emergency dispatch center. During this emergency situation all personnel will respond and work under the direction of either the designated incident commander or under one unified command. The last section of this North Dakota Mutual Aid Agreement contains an addendum which identifies the supporting costs that will be billed by the responding party after rendering aid mutually according to this agreement. The addendum contains details to the operation period. And the reimbursements required for fuel and oil, consumable supplies, return to station clean up, equipment damage repair and replacement, the salaries of responding personnel and back-fill personnel. There actual costs and salaries and the discount card and the stipend cost by the responding party. If you have any questions or recommendations as to the template or the Mutual Aid Agreement itself, you can send an email to nddes@nd.gov or call up on this phone number (701) 328-8100.